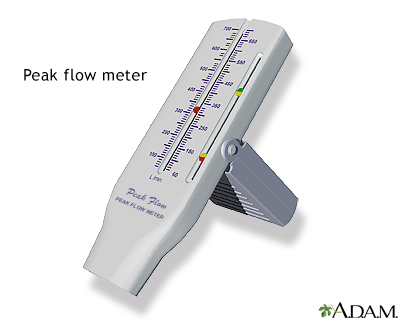 A peak flow meter is commonly used by a person with asthma to measure the amount of air that can be expelled from the lungs. If the airways become narrow or blocked due to asthma, peak flow values will drop because the person cannot blow air out of the lungs as well. A peak flow meter can be a useful aid in monitoring a person's asthma over time and can also be used to help determine how well a patient's medications are working.